You don't need a New Year's resolution to realize it's time to get your life in order. But guess what? You don't have to rely on your tired ol' noggin to keep track of everything in your life. That shiny slab of glass in your pocket is overflowing with excellent apps that can organize practically everything imaginable for you. And whether you're reading this on January 1st or on June 3rd, now's as good a time as any to embrace their organizational prowess and give your brain a break. 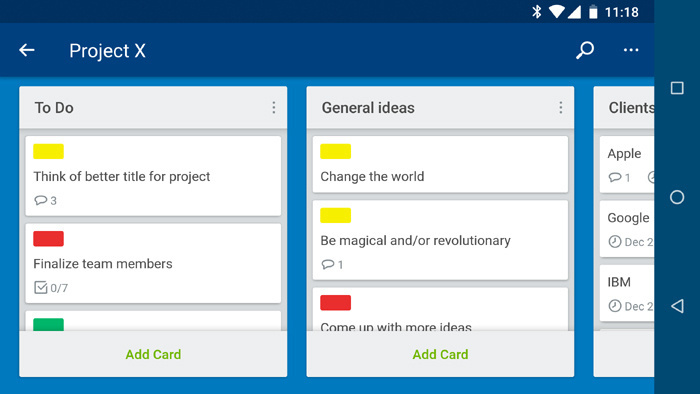 Whether you're working with a team or trying to keep your own independent projects in order, Trello provides an intuitive yet feature-packed system for organizing ideas and tracking progress. The app breaks your business down into a series of boards. Within each board, you create a series of lists. And within each list, you add any number of cards — individual items that contain text, photos, files, and so on. You can label and color-code cards and assign due dates, and you (and anyone else you invite) can comment on cards to add in thoughts and updates. Trello provides a powerful and versatile system for organizing all types of projects. Trello is free with optional $5-a-month subscriptions and business plans that unlock additional features such as larger file attachments, management capabilities and unlimited integrations with other business apps. 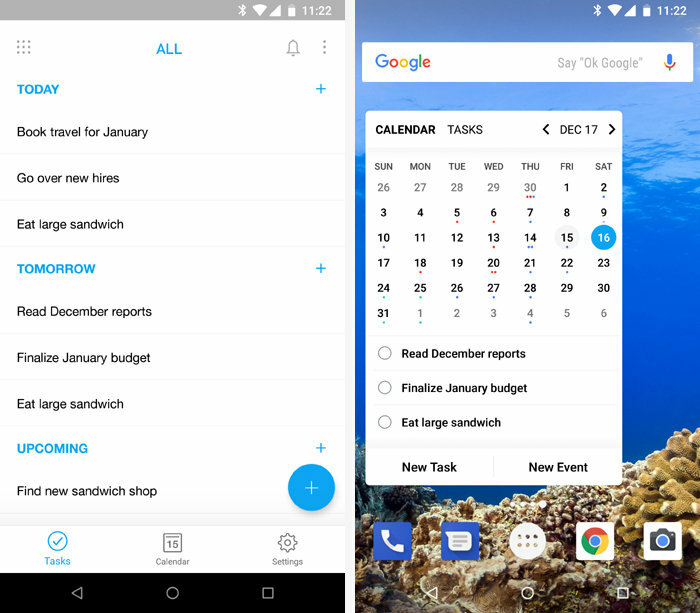 There's no shortage of tools for taking lists on Android, but when it comes to serious task organization, Any.do is a cut above the rest. The app features a clean and easy-to-navigate interface with oodles of useful features for making, organizing, and — critically — actually progressing through all types of lists. Any.do's main screen automatically separates your tasks into four default sections: "Today," "Tomorrow," "Upcoming," and "Someday" (though you also have the ability to create your own custom categories). You can drag and drop tasks between the lists and attach notes, files, recorded audio, and reminders to any items. You can even view and manage your device's native calendar within the app, right alongside your tasks, if you want. Any.do has quite a few helpful extras, including an optional "quick-add bar" that puts your current day's tasks into your notification panel, an assortment of nicely designed home screen widgets, and a clever pop-up alert system for reminding you about missed calls. Any.do's main screen, at left, and one of its home screen widgets, at right. The app is free with optional $2-to-$3-a-month individual and group subscriptions for advanced features such as location-based reminders and unlimited attachments. If you ever feel like your brain could use some supplementary storage, Evernote is the app you need. 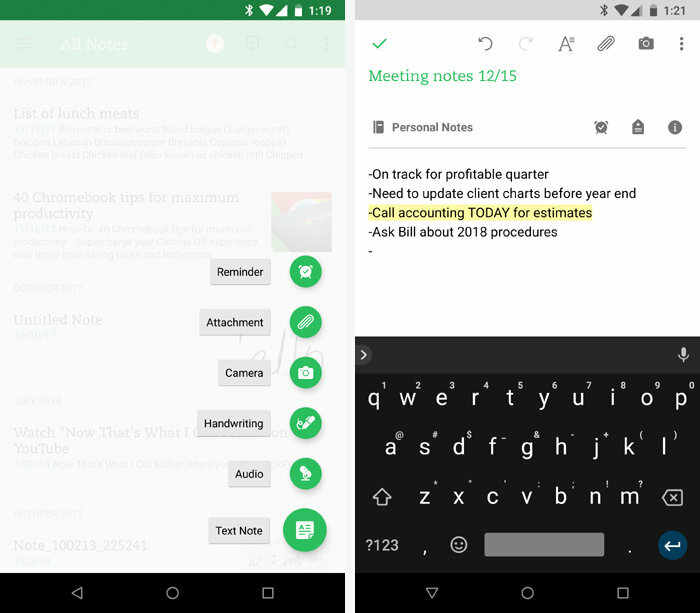 It's not the simplest Android note-taking app around, but for anyone who has a constant barrage of assorted incoming data, it's the best fully featured option for pulling different types of info together and keeping everything organized. Evernote makes it easy to take notes from your phone in a variety of ways — by typing or speaking in the app itself, via a home screen widget, or via an optional notification-based quick-add bar — and with some plans it also allows you to forward emails for safekeeping and save entire web pages from your mobile or desktop browser for later reference. Evernote's extensive options for note-taking and management make it an avid organizer's dream. With a robust note-editing system, customizable notebooks, and tags for multilayered categorization, Evernote is the note-taking app for folks seeking extreme organization. The app is free with limited service, $35 a year for more extensive features including offline access and the ability to forward emails into Evernote, and $70 a year for the full monty. Business plans are $12 per user per month. 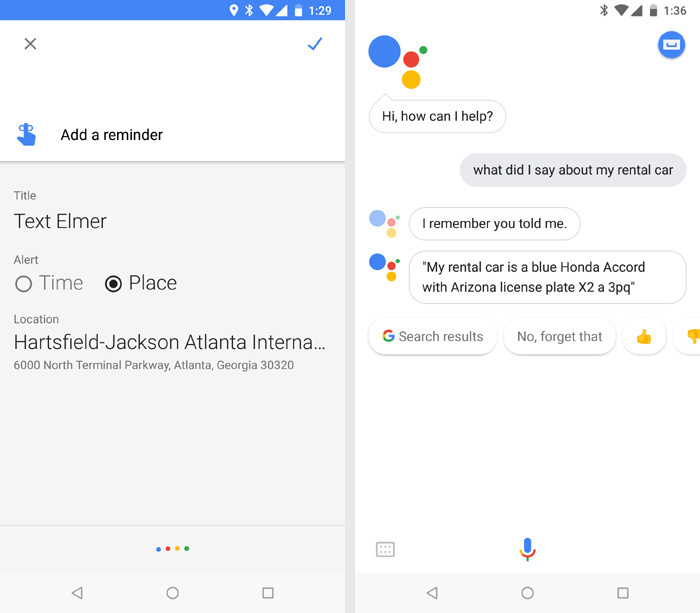 For fast on-the-go reminders, you can't do much better than your device's built-in Google Assistant (which is now available on most Android phones running Lollipop (Android 5.0) or higher and tablets running Marshmallow (Android 6.0) and up — try long-pressing your Home key or configuring "OK, Google" voice activation to find it). When you need to remember something at a particular place or time, just tell Assistant what it is and how you want to be reminded. For instance, you could say "remind me to buy figs when I'm at the grocery," "remind me to talk to Myrtle when I get to work," or "remind me to call in the lunch order at 11 a.m." When you reach the appropriate time or place, your phone — and any other compatible devices on which you're signed in — will alert you. When you just need to remember something and don't want an alert, meanwhile, simply tell Assistant to remember it — "remember that my rental car is a blue Honda Accord with Arizona license plate X2A3PQ," "remember that Murray's wife's name is Hortense," "remember that the Boston office Wi-Fi password is 'pickle123,'" and so on. Then, when you need to recall the related info, all you have to do ask (see the screenshot below). Google Assistant can keep you from forgetting all sorts of important information. Automated organization — doesn't get any easier than that. Sure, you know Google Maps is great for navigation — but did you know you can also use it to keep track of important places? 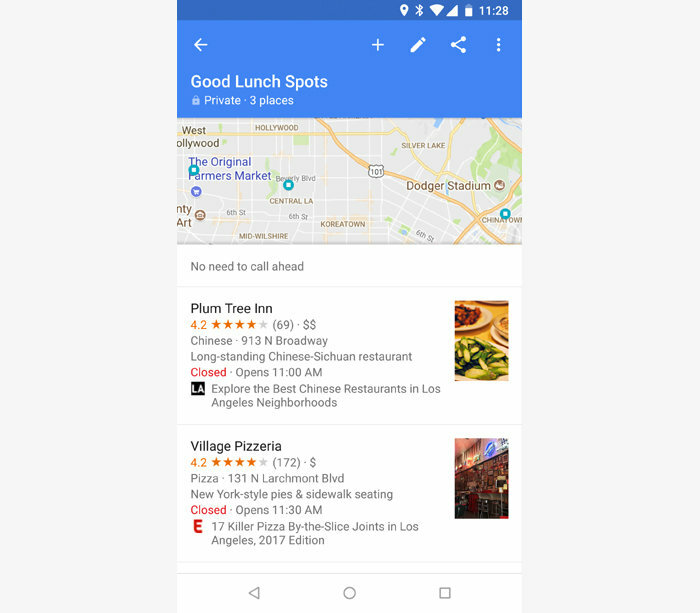 Open up Maps, then open the main left-of-screen menu and tap "Your Places." Go to the "Saved" tab and tap the blue plus icon in the lower-right corner of the screen. That'll let you create a collection of related places — like good spots for business lunches or all of your client offices within a particular area. You can then pull up all those places on a single interactive map for easy browsing or navigation. Google Trips automates your travel organization. Maps can also remember your parking location and then help you find it later: Just open the app and tap the blue dot that represents your current location, then select "Save your parking" from the menu that appears. If you want, you can even add notes or photos and set a timer-based reminder. You'll then see your saved location in a box at the bottom of the app as well as in a notification at the top of your display. 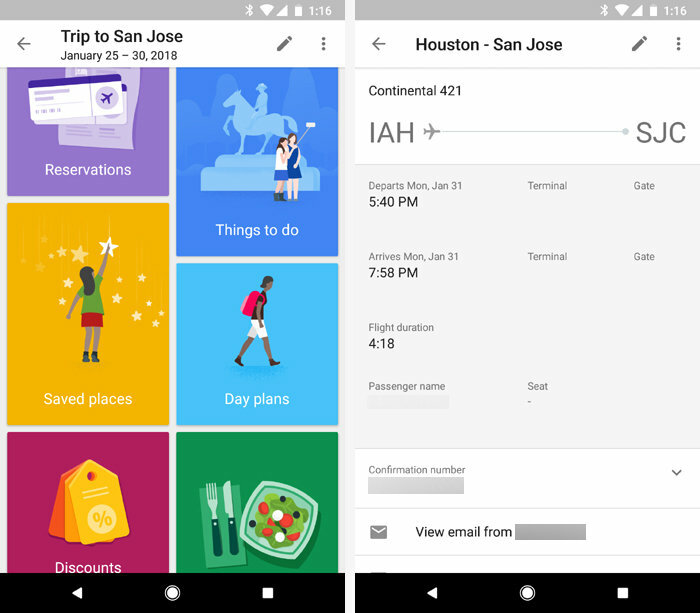 If you use Gmail (or Inbox) and do much traveling — be it for business or for pleasure — you'll definitely want to grab Google's little-publicized Trips app for Android. The app automatically pulls travel details from your inbox — everything from flights to hotels and rental cars to reservations — and then organizes all the information into trip-based bundles. You can see all your plans in a single spot and even pad them out by browsing through destination-specific attraction and dining suggestions. Google Maps has some handy hidden organizational features. Trips makes it easy to share your itinerary with others, too — and best of all: You don't have to put an ounce of effort into any part of the process. Trying to keep track of receipts for business-related expenses is one of life's great annoyances — but wait! There's a better way. Whether you're logging expenses on the road or receiving bills via email, Expensify does all the organizational work for you. 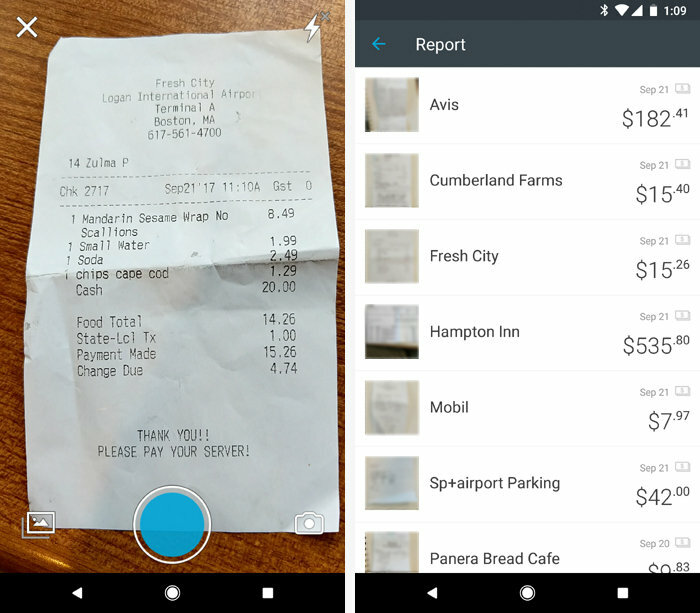 You simply scan any physical receipt within the app, and it'll extract and log all the relevant details. For electronic statements, you can forward them to a specific address and have the same thing happen. Expensify makes it easy to save and organize your business expenses. Expensify can even categorize and notate your expenses based on custom rules you create. And when all of your data is collected, it can organize it into ready-to-send expense reports or transmit the info directly into your accounting software. The service costs $5 a month or $9 per user per month for a business-level subscription that includes features such as corporate credit card reconciliation and multi-stage approval. The internet tends to have more alluring content than a day has available time. The trick to getting around this discrepancy lies in an app called Pocket, which makes it super-simple to save stories from any website — on any device — for later reading. 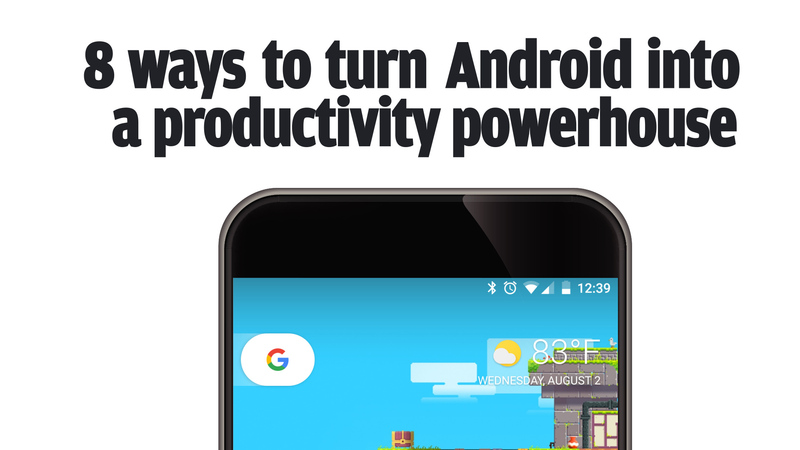 All you do is click a button from your computer's browser (using Pocket's Chrome, Firefox, Safari, or Opera extension) or use the Share command from your Android browser to save something into your Pocket library. You can tag it, if you want, for extra organization. All the stories you want to read, organized and available anywhere with Pocket. Then, when you find one of those rare spare moments in your day, pull up the app on your phone to find all the fascinating content you've collected — regardless of whether you're online or off. 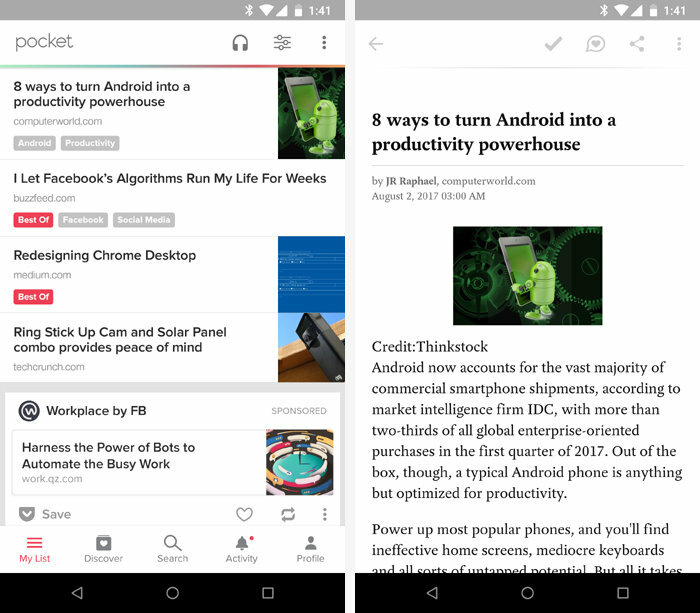 Pocket is free with an optional $45-a-year subscription for ad-free viewing and advanced features such as the ability to search saved articles by full text, tag, author, or topic.